In order to defeat his adversary Apocalypse, Mr. Sinister orchestrated the birth of Nathan Summers, who is destined to become the time-traveling hero Cable! A link between present and future, Nathan Summers, A.K.A. Cable is the biological son of X-Men member Cyclops and Madelyne Pryor, a clone of Jean Grey. Actually, evil geneticist Mister Sinister plotted his birth from his obsession of creating "The Perfect Mutant" and with an intention to use him one day against his former master, Apocalypse. Since Jean was placed in a cocoon at Jamaica Bay after her encounter with cosmic Phoenix Force, Sinister made a clone of her but what it lacked was her memory. At first, Sinister thought his experiment was a complete failure but when Madelyne received some of Jean's memories through Phoenix Force, he sent her to meet Scott Summers. All he wanted was an offspring from the union of Madelyne and Scott for his plans to succeed. This plan worked as Jean was thought dead and Scott felt very drawn towards her because of her uncanny resemblance with his lover. They married, she eventually got pregnant and they had a son whom they named Nathan Christopher Charles Summers. Troubled by his own, Scott lost his leadership to X-Men, so he decided to retire for the time being and raise baby Nathan with his wife Madelyne. However, their marriage starts reaching to a point where he starts avoiding her and would often miss Jean instead. To make matters worse, Jean Grey turned out to be very much alive and Scott left behind Nate with his wife. Scott rejoined his friends from X-Men to form a new super-hero team called X-Factor. Sinister sends his Marauders to bring Nathan to him and kill Madelyne to remove any evidence that suggests there was a clone of Jean. Nathan was captured and taken to Sinister's secret lab for further experiment while his mother barely survived the attack. She was also attacked in the hospital but luckily for her, Wolverine came in with the team of X-Men to rescue her. Madelyne later learns why Scott has abandoned her and started to lose grip on her sanity. Dubbing herself as Goblin Queen, she agreed to help demons S'ym and N'Astirh to unleash demons from Limbo on Earth to get her son back. Scott and Jean rescues Nate from Sinister's lab while fighting Nanny and Orphan-Maker. As baby Nate starts growing up, he starts developing telekinetic powers but soon is kidnapped by Riders of the Storm. They took him to their base on Blue Area of the Moon and Apocalypse then infected him with the deadly Techno-Organic Virus. It was rapidly spreading liquid metal and organic steel over his body, which would kill him if it cannot be stopped in time. Cyclops is visited by Sister Askani from the alternate reality of Earth-4935, who took Nathan with her. In the alternate timeline, Apocalypse has taken over and Nathan is raised by Mother Askani, his alternate timeline sister Rachel Summers. He was taught to use his vast powers to frequently keep the lethal virus in his system on check. Often worshiped as "Dayspring" and "Askani'son" by members of Clan Askani, he was deemed to be their savior in future. The virus in his system progressed so far that she feared the boy probably would not survive and so she made a clone of him as part of a contingency plan. Minions of En Sabah Nur broke in to kidnap the boy for their master and ended up taking his clone after killing many members of the Clan Askani as Rachel has already removed Nate. Apocalypse was unaware about the clone of Nathan Summers and believed he got the real baby. Naming him Stryfe, he planned to raise the boy as a vessel for the time when he will need a host body. Meanwhile, Scott and Jean are taken to future by a badly wounded Mother Askani, who handed Nate to them before slipping into coma. The couple knew by now that this boy is going to become Cable and started raising him to be the soldier he is destined to become. When he encountered Stryfe for first time, Nate defeated him on Apocalypse's citadel. He was telepathically taught by Rachel to destroy Legacy Virus and how to contain the deadly Techno-Organic Virus in his own system. As En Sabah Nur was preparing to switch his consciousness into Stryfe, Nathan reached there with Scott and Jean. He disturbed the telepathic links between the villain and his host, which seemingly killed Apocalypse. With that, Rachel starts dying, his parents are sent back to future and Nate remained to restore balance on Earth-4935. After fruitlessly trying to restore peace over and over, Nathan grew tired of Askani ways and decided to face Apocalypse before he conquers everything. He arrived in ancient Egypt right after En Sabah Nur discovered the Celestial Ship and engaged with his Dark Riders. Calling himself as The Traveler, he dispatched all the minions and is threatened by an ancient evil Skornn, who feeds on humans and mutants. Despite his best efforts, Nate was unable to kill it as it was an immortal being that can only be slain by a dagger, Five Fingers of Annihilation and with help from a sorceress D'narda, he managed to kill it. In another of their confrontation, Nate shot En Sabah Nur straight to the head and his not-so loyal Dark Riders took him for their newest leader but he declined the offer. His cybernetic arm was severed during their battle and Nur’s blood mixed with Nate's techno-organic infected remains allowed Ozymandias to revive his master later. When he learns that his blood actually helped resurrect the villain, he sends him away in space along with his Celestial Ship. Ozymandias states that, although Nathan was traveling through time to find out a way to stop Nur, it is what actually helped him after all. In his attempt to understand the threats of modern era, Cable formed a mercenary group called the Wild Pack and mostly worked with an arms dealer named Mr. Tolliver. His orbiting space station Graymalkin became a means of transportation for various situations. Soon, time-traveling mutant came in conflict with fellow merc Silver Sable, who had her own group of the same name and then changed it to Six Pack when his fellow team-member suggested of it over a drink. He discovers that his cloned-half, Stryfe has been backing his contractor Tolliver and he then abandoned their mission halfway. Nathan and his team later broke into a Hydra research facility and are threatened by an image of Baron von Strucker. Though the mission was successfully completed, they were being played by A.I.M. 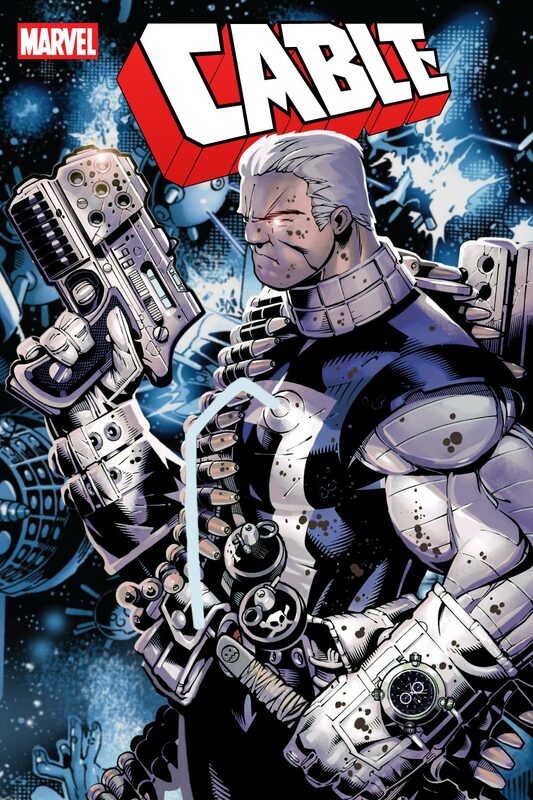 and for a payback, the team goes after Stryfe and Cable managed to wound him, which lead to the destruction of site and his team disbands afterwards. Nathan Summers comes to present day Boston from the year 2087 to find it swarmed by the plants of Shredded Man. His bleeding edge AI, Belle suggests that the current catastrophe the world is going through could be related to M-Pox. Cable came across one of those plant-based creatures that he blew away with a force blast from his Psimitar. Seeing Wade as an Avenger in a newspaper, Nate gets really worried thinking how bad things have gone. He soon joins Deadpool, Doctor Voodoo, Rogue and Synapse during a fight while handing Quicksilver an enzyme to synthesize more of it and administer among the ones infected before getting back to blast away the Shredded Man. Rogue falls flat upon confronting the villain and Nate tends to her care with antitoxin. He finds out the one they are fighting is a relative to Emily Guerrero AKA Synapse and when he received a psychic flash of her snapping the neck of Shredded Man, he stops her. Nate then forces the ecological maniac to reverse everything by jeopardizing her life. Although he never officially joined the ranks of Uncanny Avengers, Cable stayed around to help the team. He helps out Synapse to get better at using her telepathic power and lead their team to pursue Wrecker as he attempts to escape Pleasant Hill. 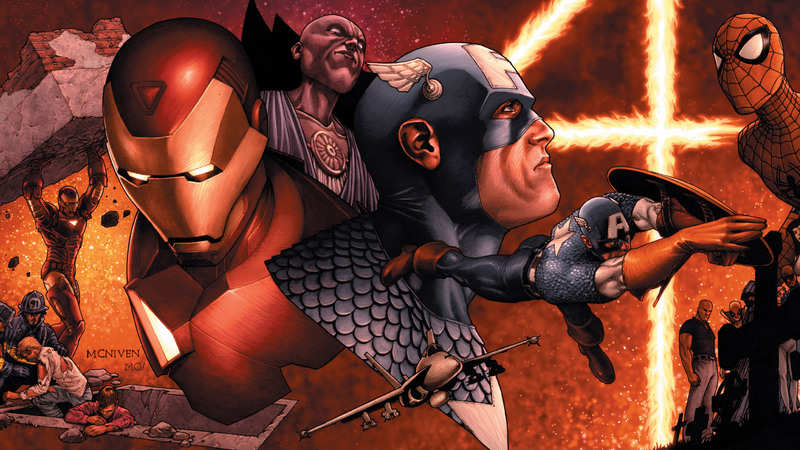 Together they fight back S.H.I.E.L.D. to help Maria Hill from getting imprisoned into her own prison. After wrapping things up with her, an Ultron-possessed Hank Pym returns to Earth and Nathan asks his suit for peer review but he shows that there is not much organic part left. Cap asks him to prepare a non-fatal way to neutralize Hank just in case. When Nate learned that Janet flunked him, he pushes Hank to the point where he lost his cool. He blew up the Schaefer Theater the team resided in only to be hit by an E.M.P. next from Wasp until more cavalry of heroes arrive. Ultron then infected Deadpool with his organism that Cable pulled out of his body using his power of telekinesis and helped the team encase the murder bot into Hulkbuster Armor before hurling it into the sun. When members of the ancient group of mutants known as the Externals starts dying one by one, Cable made it his one-man mission to find out the mysterious mutant killer by drafting Doop, Longshot and Shatterstar into his cause before facing the vampiric Selene. They find out that she has already assembled the formerly deceased Externals at her side. Armor and X-23 joins Cable's crew before discovering the rest who didn't join the Black Queen of Hellfire Club ended up dead. She brought an amnesiac Blink to her side as a secret weapon and eventually learns that their unknown assailant is none other than an old enemy named Gideon, who previously fought the X-Force. One of her allies turned on them while the mutant mimic grows too powerful for any of them to stop. The Black Priestess sought help from Nathan and then tries to take care of this External business by herself but Gideon proved too powerful for them. The beast was finally slain using an energy portal by Clarice with some guidance from Nate. 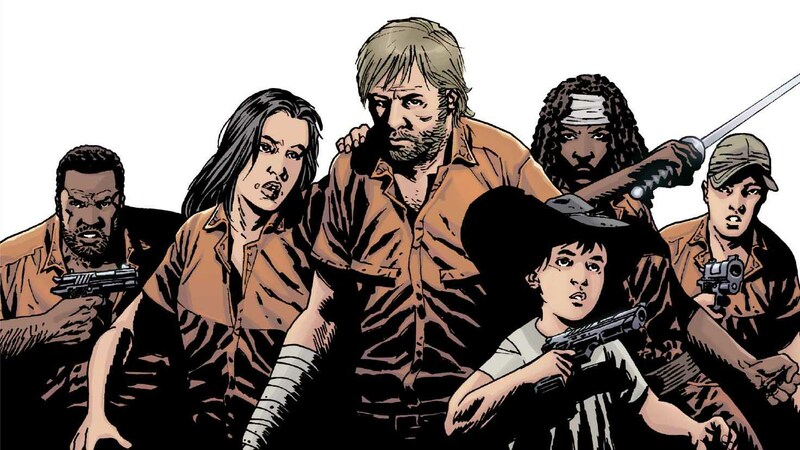 For more information on Cable comics series, you can check out these links below. Here is your links to buy "Cable" comics from Marvel Comics on Amazon. 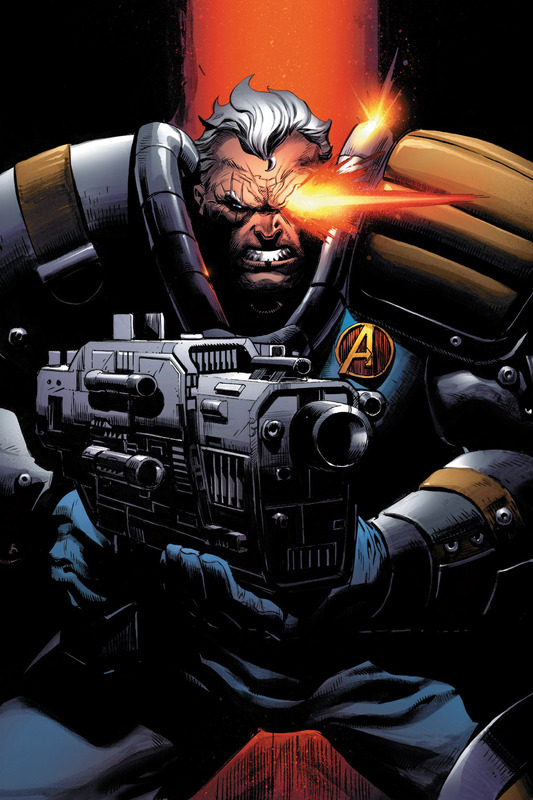 Cable is a time-travelling mutant superhero of Marvel Comics who first appeared in New Mutants #86, which was a cameo and made his full appearance in New Mutants #87. 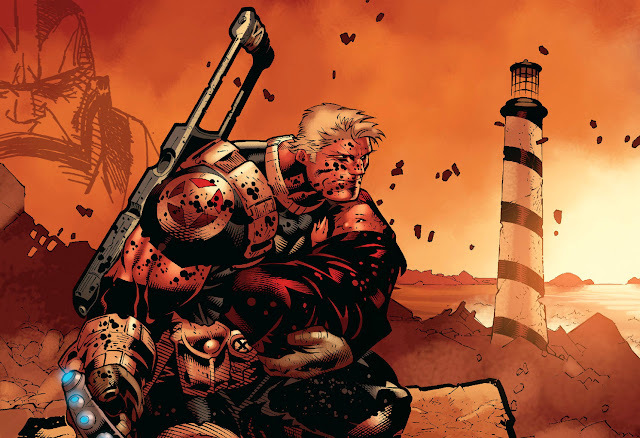 The creator credit for Cable goes to artist Rob Liefeld (Heroes Reborn – Captain America, Onslaught Reborn) who at that time was working on that monthly ongoing series. Over years, many talented comic-book writers and artists have taken their turns on this character that has molded him into the hero he is today. However, it seems take on his character by artist Chris Bachalo (Captain America – Homeland, Dark Reign – The Sinister Spider-Man) is the best portrayal there is till date. In years of publication, Cable traveled to present and went back to future in time to save timelines countless times. He founded groups like Clan Chosen, Six Pack, The Underground and X-Force, while also leading them. Aside from leading New Mutants, he was also within the groups of Clan Askani, Secret Avengers, Uncanny Avengers and X-Men. Nathan has also frequently teamed-up with psychotic super-merceneray Deadpool and his former lover Domino. Following the immense success of 2016's live-action, R-rated Deadpool movie, a sequel is announced for 2018 and Cable is going to appear as a pivotal character in Deadpool 2, portrayed by actor Josh Brolin.